NATS has launched an app to support general aviation pilots in the battle against airspace infringements. 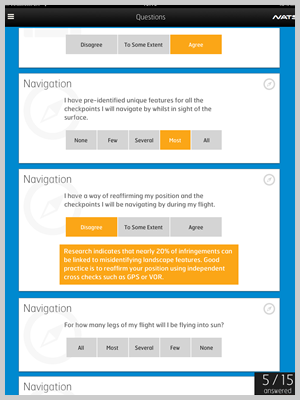 NATS Flight Prepare, available for free on both iPad and iPhone, takes pilots through a range of questions, highlighting the factors that could lead to them straying into controlled airspace. Pilots are then given a score based on their answers and can share the results on social media. Questions cover a range of topics, from the weather conditions and need to brief passengers, to the importance of contacting the Distress and Diversion in the event of becoming lost. The app has been developed following research conducted by NATS into the causes of airspace infringements. 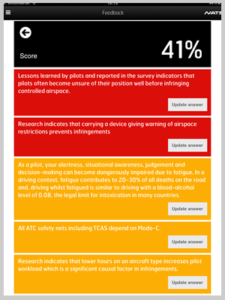 The results of 400 pilot questionnaires identified human factors, such as workload and fatigue, as major contributors. With the assistance of industry experts, including GA pilots and instructors, these were then translated into a series of questions and prompts designed to reduce the impact and likelihood of a pilot infringing. NATS’ Terminal Control Safety Manager Jonathan Smith said: “An infringement occurs every 11 hours in the UK and they’re bad news for everyone involved. The NATS Flight Prepare App is the latest in a series of initiatives from the air traffic control company aimed at reducing controlled airspace infringement rates. In January it launched the Infringement Prevention Award to recognise the clubs and schools that are doing fantastic work to reduce the number of infringements by their members.